Best View On The Lake! 2 Bedroom 2 Bath Condo On The Lake With Boat Dock. 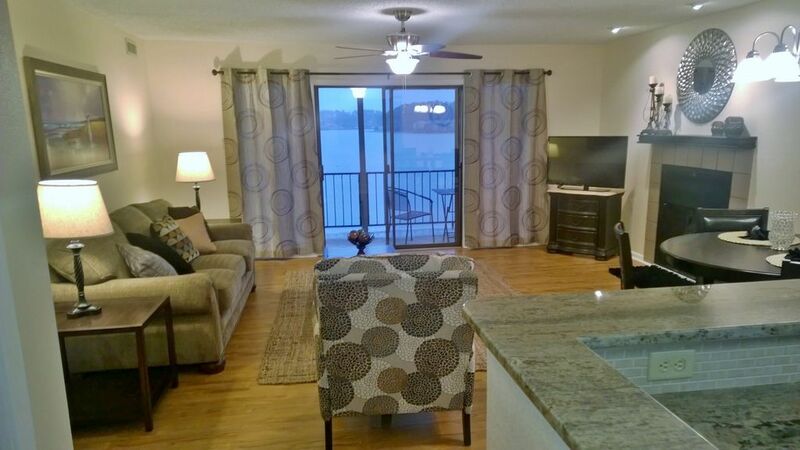 Renovation JUST COMPLETED 12/14/2015 , This fabulous 2 bedroom 2 bath 1,100.00 sq ft lakefront condo with covered boat dock is on the top floor and ensures panoramic views of Beautiful Lake Hamilton, from inside by the fireplace or outside on the balcony with a glass of wine watching the sun set. Bring your boat and enjoy the clear refreshing water of the lake or swim in the pool after a game of tennis. Staying in ...Prepare a romantic meal in the NEW stainless steel kitchen and then dine on your balcony. This getaway has everything you need for a great escape, all your dishes, glasses , wine glasses, blender cookware, appliances, utensils, microwave, coffeemaker, toaster, linens, washer and dryer and HD TV. If dining out, you have some of the best restaurants in the country right here in Hot Springs. There are several within walking distance as well. Good sized bath rooms with granite counters, all NEW fixtures , faucets, flooring and newly constructed shower in master Bath!! Huge living area, entire condo overlooks the lake. NEW gourmet confection oven and stove in stainless steel. dishes, glasses, wines glasses, pots and pans, knives and forks. ALL New Stainless steel appliances , Open to living area, and window in kitchen. NEW dining table for 4 , with view of the lake, Eat at bar off kitchen seats 2 more! Hoping to see you soon, so you can fall in love with Lake Hamilton and Hot Springs like we did ! The condo was fabulous and clean! The owner was great to work with! This was a great condo for a family get away!!! The welcome drinks were amazing to have waiting for you after unpacking!!! This Lake Hamilton condo was GREAT and the view WOW, even when sitting in the living room !!! It was close to everything yet out of the way enough to be quaint. We rented a pontoon from Kahuna Bay for the day and just cruised the entire day. We also took the suggestions of previous reviews and agree that J&S Italian Restaurant, Garvan Gardens, Bath House Row and the Promenade behind it, Superior Bathhouse Brewery and Bathhouse Row Winery are a must. The owner Marianne was such a pleasure to work with. We will be back !!!! You are the sweetest Family and are Welcome back anytime ! Thank you for the amazing review .. It means the world to us ! Perfect location and very communicative, welcoming hostess! We will be back!! We loved the location on the lake. We loved the condo! 2 bed and 2 bath was perfect for our family. Thank you, Marianne!! The condo was perfect! Just enough room. We loved sitting on the patio and watching the sun set over the water! Marianne was so sweet, we will definitely be back! Brittany !! You are so sweet !! and Thank You for the great review ! It means so much to us ! Please come see again Soon ! Just call me direct next time you would like to come back. My husband, daughter, and I had a wonderful time in this condo. It has a beautiful view and we loved having the boat slip, so we could access the lake early and late. Marianne was a wonderful hostess and even allowed us to check in a night early free of charge! Only thing we would change are sheets in the master bedroom. For some reason, they would not stay on the bed. My husband and I don’t move much during the night, however they always managed to come undone which was quite uncomfortable. Otherwise, we had a perfect stay. Would highly recommend! Thank you for sharing your lovely condo with us! It was so awesome having you with us ! I am so sorry about the sheets .. I think I know what happened .. House keeping accidentally put on a set that didn't belong there. Please come back and see us !